To raise funds to support the rebuilding of the lives of the people of Thailand, particularly those on the Island of Phi Phi, and with special emphasis on helping the young people. Our 6th sponsorship donation for our orphans Tirayoot, Payayat and Sugunya has been made to the Sriphong Phukaoluan Foundation in Krabi. Earlier in the year we received the annual reports on the three children along with the annual report for the Community Bank which we have donated to in the past. Tirayoot has settled well now he is living with his mother, step-father and step sister. 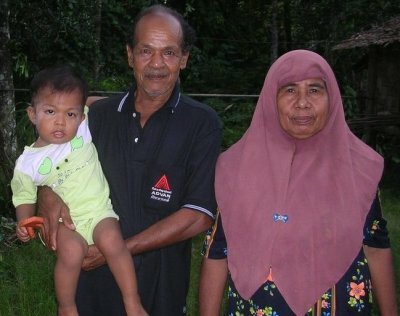 Although he now lives in a different village to his grandmother, who was his original carer, he still has contact with her. He is now in the 1st grade at school and is described as "a very active and sociable boy who is in good health." Payayat and his grandparents have moved to a village they lived in years ago. This is nearer the ocean and easier for his grandfather to work as a fisherman. His grandparents also make and sell food near their home. Payayat's father still lives and works on the Island of Phi Phi and he doesn't see him very often. His grandparents take good care of Payayat and he is described as being "quite polite and responsible and in good health." Sugunya is now 15 years old and in her 1st year of high school at her boarding school in Hat Yai City. She continues to be a good student and takes an active part in school activities. Earlier in the year she won an award in First Aid from the Red Cross during their learning programme at school. Her mother now lives and works on the Island of Phi Phi, while her older sister lives in the family home. The home had fallen into disrepair but the family were able to obtain help from a foundation in Bangkok to make necessary repairs. Sugunya is described as being "a well adjusted girl and is in good health." We have just transferred our 5th sponsorship donation for our 3 orphans to the Sriphong Phukaoluan Foundation. Although we initially only guaranteed to be able to support the children for 5 years we are pleased to announce that we can predict that our sponsorship can continue for a further 2 years with the funds we have raised and the generosity of our many supporters. Tirayoot is now 6 years old. He now lives with his mother, stepfather and baby step-sister near Koh Lanta. Tirayoot is happier now that he has settled down and not being moved around so much. He is in good health. 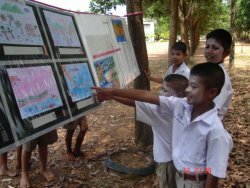 Payayat is in the 2nd grade at his school in the Klong Thom section of Krabi. The Foundation has informed us that this school has won an award as the model school in Krabi Province. Payayat continues to live with his grandparents and uncle (who is only 4 years older than him). Often the relatives from his mother's side come to visit him and take him out for the day. His grandmother continues to sell chickens in front of their home and with a loan from the Foundation Community Bank his grandfather is hoping to buy fishing equipment so he can go back to his old job as a fisherman. Payayat's father still works on the Island of Phi Phi as a boatman. Payayat is an average student at school and his health is good. His family life is stable and there are many family members to care for him. 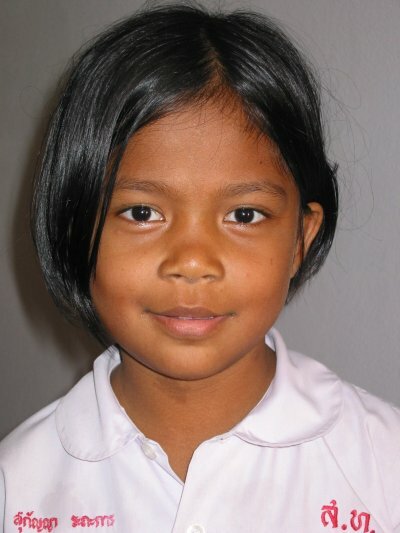 Sugunya continues to do well at her boarding school in Hat Yai City. Her mother visits her often and her brother will also be attending the same school next year. She is in good health. Her mother lives in the same house and looks after four or five children during the week for relatives. She would like to open a nursery school for young children. As further support of the Sriphong Phukaoluan Foundation we would like to raise awareness of the 5th Anniversary Tsunami Memorial DVD they have produced called "Helping Hands". This mini-documentary highlights the recovery of the seaside communities in Krabi and includes the original theme song, "Helping Hands" by Gary Gates and Robert Reynolds. Proceeds from the sale of the DVD go to support tsunami children and orphans in the award winning "Tsunami Child Sponsorship Program" which we belong to and is administered by the Sriphong Phukaoluan Foundation. We were sad to hear of the sudden death of Tirayoot's grandfather. We received this news just days after we had sent additional funds to help him purchase new fishing nets and tackle. When Robert Reynolds (Director of the Sriphong Phukaoluan Foundation) contacted us we were pleased to instruct him to pass the funding on to Tirayoot's grandmother. At the same time we provided some extra funding to allow Payayat's grandparents to set up a small chicken farm to subsidise their very meagre income. The annual sponsorship for our orphans Tirayoot, Payayat and Sugunya was paid to the Sriphong Phukaoluan Foundation in November 2007 and we have received updates on the children and thank you notes. Tirayoot is now 4 years old and still in Kindergarten School in Krabi. Each day he travels 20 kilometres each way to school in the school van, which is additional expense for the family. His grandfather continues to work as a fisherman. Tirayoot's overall health has improved and he is more outgoing and communicative now he is a bit older. He enjoys taking part in the Foundation activity days. Payayat is now 6 years old and is in his last year of Kindergarten in Krabi. Payayat continues to live with his grandparents, although they have recently moved inland. The house, whilst being described as primitive by the Foundation, is kept clean. Although Payayat's father has re-married and lives on the Island of Phi Phi with his new wife but does still visit Payayat. Payayat's grandmother has recently been ill and is unable to work but his grandfather still works as a rubber tree tapper. Payayat is still described as a shy boy but his teachers say his school work has improved and his health remains good. Sugunya attends the Muslim school in Krabi. Her grandfather takes her to school every morning and he has told the Foundation staff that he believes her education is very important. Sugunya continues to live with her grandparents and siblings. She is well supervised and the Foundation describes the family unit as quite strong although her mother now lives and works on the Island of Phi Phi. Sugunya attends all the Foundation activities and especially enjoyed the recent Foundation Camp and Field Trips. Sandra will be visiting Krabi in February and will have the opportunity to meet the children so we await first hand news and photographs. Her visit will also be an opportunity to assess where further funding could be targeted. Sponsorship for 2007 for our three orphans has been paid to the Sriphong Phukaoluan Foundation and we await an update on the health, education and well being of Tirayoot, Payayat and Sugunyah. We have also sent a donation of £2000 to the Foundation's Community Centre project. The Foundation is currently working hard to raise money to build a Community Centre in Krabi to help address the long term implications of the tsunami . The residents of the tsunami affected areas are still confronted with many difficulties - having lost their homes, their families and their means of support, many victims are still facing an uncertain and difficult future. Uprooted from their towns and villages, separated from family members with children going to unfamiliar schools, for many, stable social structures have been shattered. In the light of the long term affects that are crippling many residents the Sriphong Phukaluan Foundation is proposing to create a Community Centre that will assist these victims and help them return to a more normal way of life. Address the need for elderly care and support (many grandparents are now guardians for the children who lost their parents or family members). The NATANDY Fund has chosen the Sriphong Phukaoluan Foundation - Adopt an Orphan programme as their first project. 40,000 Baht (approx £560) provides sponsorship for 1 child for 1 year. Sponsorship pays for a child's tuition, room and board, transportation, school uniform and supplies and basic necessities. In addition representatives from the Foundation visit each child at least once every three months to examine their status and determine the suitability of the benefits. Sponsorship also helps to support the running of free monthly medical clinics, occupational courses, family re-unions and any long term medical care necessary for the child. The Foundation supports 101 orphaned children and their guardians/ families - due to the huge success of the NATANDY fund to date we have been able to adopt three of these orphans. The Phi Phi Island fund has been set up to help the children continue their education beyond the age of 12 years, which is when they must leave the school on Phi Phi. The students who continue their education in Secondary school or college will receive a sum of money for each year they attend. Also every child from Phi Phi, regardless of where they are currently living will receive a gift from the fund in December of each year. 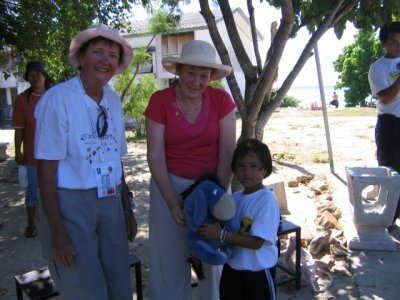 Whilst the families were in Thailand for the 1st Anniversary of the Tsunami, Sandra and Barbara visited the school to hand out a selection of toys to the children. This included some of Natalie's huge collection of Winnie the Pooh cuddly toys. Whilst the families were in Thailand for the 1st anniversary they visited the Cape Pakarang Boatyard. They were so impressed with the work being carried out there that they decided they would like to fund the building of replacement long tail fishing boats for fisherman in the Khao Lak area. The fund has been able to help build two boats and the families feel very honoured to have met people who are working so very hard to help the victims of the Tsunami put their lives back together and regain their livelihoods. 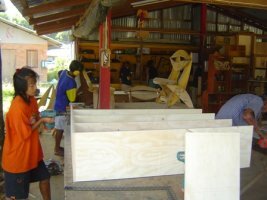 As a tsunami relief project the boatyard tenure at Cape Pakarang will end in March 2007 - two years since it was set up. During this time 115 longtail fishing boats have been built. 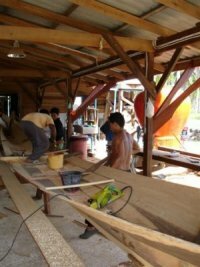 Along side several other boat building projects in the region, the Cape Pakarang Boatyard has facilitated the replacement of almost all of the fishing boats lost in the tsunami, with the exception of remote and poor communities such as the Moken sea gypsies on Surin Island, 50kms north of the Khao Lak area. Bob Bay is a small Moken (sea gypsy) village of 220 people that received little assistance after the tsunsami and is still struggling nearly 2 years later to replace and repair their longtail fishing boats. We were pleased to be able to provide Cape Pakarang Boatyard with NATANDY funds to help support their current project in this community. 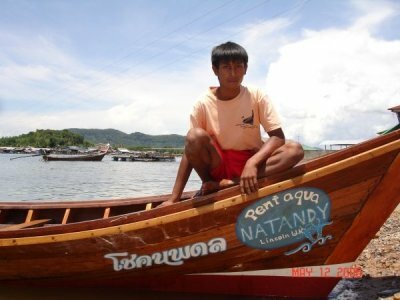 The second boat was named NATANDY Pentaqua, Lincoln UK. Dedicated to Andy and Nat's swimming club who raised an amazing amount of money doing a sponsored swim for the fund which bought this boat - read all about it on our 'news & events' pages. This boat was painted with a special logo in keeping with the design of the original. The club were thrilled! The families are very proud of these beautiful boats and look forward to being able to go back to visit the area in the near future to track down their boats in operation. 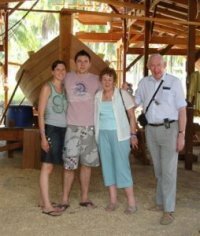 When the families visited Khao Lak during Christmas 2005 they heard about other areas of work being undertaken by the Tsunami Volunteer Center (TVC) who set up the Cape Pakarang Boatyard. They were keen to help with these new projects. 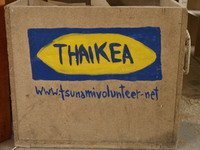 In March 2006 the fund sent a donation of £1000 to the TVC Thaikea furniture building project. This project allows villagers and volunteers to work side by side to meet the demand for furniture for the newly built homes in the villages and schools in the area. "Former fishermen and workers wanting to learn a new trade find the Thaikea project an environment to recognize and respond to the immediate and long-term needs of their own villages." The NATANDY donation was sufficient to fund the building of basic furniture for 20 new homes in Bang Kayah and the surrounding area. 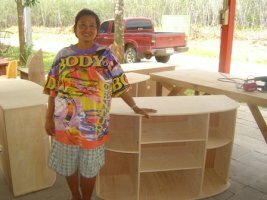 In April 2006 The TVC set up a new Thaikea workshop in Tung Wa, a 71 home community of Morgan people (Sea Gypsies) The fund donated a further £1000 to be put towards the purchase of the initial supply of 500 sheets of plywood out of which the furniture is constructed. A further donation of £1000 was sent to the TVC in November. This donation is going to be used to help support the TVC "Learn from the Tsunami Progamme", which gives the children an opportunity to express their experiences through art and drama, to be able to view the past in a positive light, and to inform other students in Thailand about the tsunami. Part of our donation is going towards the production of a "Learn from the Tsunami" book. It will contain drawings and stories by children who have participated in the programme over the past 18 months. As well as being circulated to all participating schools and donors, it will also be on sale to tourists in the Khao Lak area to raise more funds for children's activity projects. We look forward to receiving our copy of the book. The remainder of our donation has been allocated to purchasing resources for Tsunami Classrooms. These are resource centres located in 15 schools, which have colourful wall murals, multimedia and computer stations, and shelves filled with books about earthquakes, tsunamis and other natural phenomena. In these rooms the children affected by the tsunami can reflect on the past, learn why the tsunami happened and make plans for the future. Barbara and Sandra were delighted to receive copies of the book "Memories from Children's hearts", which our latest donation helped to fund. The comic strip book showcases the children's memories and thoughts about the tsunami and was published in time for the second anniversary. The visual representations of their many experiences enabled the children to express thoughts and memories which they were unable to talk about. Despite having young hearts, the surviving children recall many stories which need to be recorded for future generations, creating another page of history about the events of 26th December 2004. 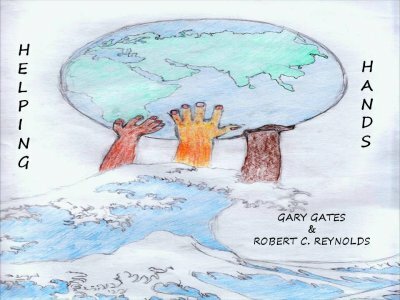 "The children affected by the tsunami are like little caterpillars facing a strong storm, clinging onto branches and, although perhaps slow and weak, they must accept the situation. The caterpillar must move on every day, just like the kids affected by the tsunami, who take encouragement from others around them and generate empowerment in themselves, and get better and stronger just as the caterpillar will one day become a beautiful butterfly." 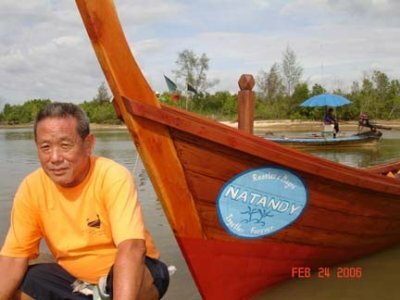 Natakarn Songpakdee - Learn from Tsunami Project Manager. Our latest donation to the TVC has been earmarked to support the Youth Volunteer Club. This club was opened due to the big demand for after school and weekend activities. Activities include taking students to help at various needy projects such as homes for Aids Orphans and teaching them to volunteer in their own communities. TVC volunteers also take students on weekend camps, where the emphasis is on "Caring for the environment." Other activities include taking teenagers on fishing expeditions. Many young people who survived the tsunami are frightened of the sea and this project gives them back some confidence as well as hopefully supplying supper for their families. HOPE TO GET PHOTOS TO SUPPORT YOUTH VOLUNTEER CLUB SHORTLY. Andy and Natalie were staying at the PP Princess Diving and Spa Resort on Phi Phi when the tsunami hit. 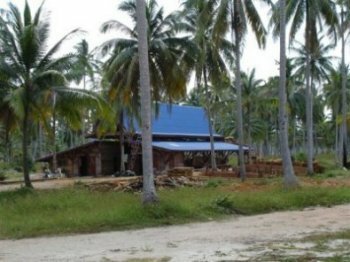 PP Princess and PP Charlie Beach Resort next to it, both owned by Charnnarong Taecharachkij (Charlie) were the most damaged hotels on the island. They lost over 40 of their staff and 24 children were orphaned. Following the tsunami Charlie and his wife set up the Princess and Charlie Tsunami Relief Fund in order to be able to provide scholarships for the children of the deceased staff and help support his staff, who found themselves without a livelihood. The NATANDY fund has made a donation of £500 to this fund. Charlie is hoping to be able to start re-building his hotels shortly and once they are completed he will be able to fully support his staff and the orphans. (We recently saw a copy of a Japanese news programme, which features the wonderful work Charlie is doing to support his staff). 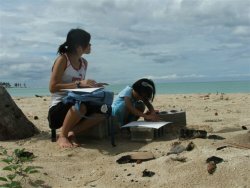 The ETC at Khao Lak provides vocational training for disadvantaged young adults focusing on those affected by the 2004 tsunami in the area of Khao Lak. It's mission is to deliver worthwhile career training and includes providing a positive force in rebuilding the local community by engaging the students in community service projects and working with local partners. Although there is a very lucrative job market in the tourism industry in southern Thailand, many low-income communities are unable to directly participate. This results in a significant need in this area for worthwhile, quality vocational training and, in turn, sustainable employment opportunities for disadvantaged young adults. The training and personal development programme provided by the ETC gives a meaningful alternative for poverty alleviation and an improved quality of life, not only for the trainees, but also for their families. "The programme is designed to truly empower and change lives." Although the main aim of the ETC is to provide young adults with marketable skills, its overall education program is guided by several themes. Computer training is a main programme component as it is seen as a key resource in today's global society. 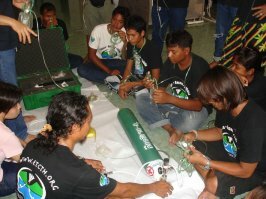 Environmental sustainability is integrated into the Diving and Ecology component. The outcome of the program is that the students, through classroom training and on job experience, will have skills to confidently function in the dive/tourism industry. They will be able to function on a professional, working level in English and Thai and with knowledge, tools and skills learnt on the training program, they will be able to function as an active citizen.